But these pathogens' high lethality, fickle seasonal and geographic patterns, compounded by a lack of preventive therapies, have frustrated scientific and public health efforts to avert outbreaks for far longer than the recent epidemics. The ultimate quest of those efforts is to develop a universal vaccine that works against multiple viruses and to design other broad-spectrum antibody therapies to rapidly treat those already infected. Now, in a small but illuminating study, Harvard Medical School scientists report that antibodies made in response to a vaccine against one hemorrhagic fever virus—Junin—can successfully disarm one of its cousins, Machupo, for which there's currently no vaccine. The experiments were conducted in vitro using antibodies obtained from a vaccine recipient. Although limited to two viruses from one family, the results set the stage for the design of broad-spectrum therapies that can work against multiple or all members of a viral family, despite significant differences in molecular makeup, the researchers say. The findings, published May 14 in Nature Communications, build on isolated reports that people and primates vaccinated against Junin appear to be more resilient to Machupo. The new study, however, provides the first molecular proof of what thus far have been merely anecdotal observations. It also identifies a common, conserved site on both viruses that renders them defenseless to the same antibodies. "Our findings raise the tantalizing possibility of designing universal therapies using antibodies made to one virus for which there is a vaccine as a way to prevent or treat other viruses for which there are none," said study senior author Jonathan Abraham, assistant professor of microbiology and immunobiology at Harvard Medical School and an infectious disease specialist at Brigham and Women's Hospital. "We believe our results are a step in that direction." The need to develop such therapies, the team said, is even more acute in an era when viruses previously limited to one region are appearing in new geographic areas, greatly fueling the risk for outbreaks in new settings. Junin and Machupo belong to the Arenaviridae family, composed of more than 30 viruses. Of those, five are known to cause human disease in South America. Even though viruses from other viral families can at times cause hemorrhagic fevers, members of the arenavirus family are considered true hemorrhagic fever viruses. The infections they cause are marked by blood vessel damage and severe bleeding in multiple organs. Between 15 and 30 percent of people infected with one these viruses develop severe symptoms and die. 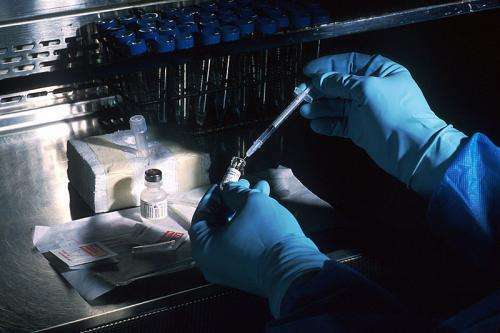 Prior to the development of the Junin vaccine in the 1980s, the virus had caused about 30,000 symptomatic infections in Argentina. The vaccine, which contains a weakened form of the virus, induces immunity and lifelong protection in about 95 percent of people who get it. As a result, the incidence of Argentine hemorrhagic fever declined dramatically from 2,000 to 50 to 60 cases a year. By comparison, outbreaks caused by Machupo have been relatively small and contained—fewer than 100 people sick at a time. Then again, Abraham points out, up until the 2014-2016 outbreaks in West Africa, Ebola too had caused sporadic, smaller outbreaks affecting dozens to hundreds of people. "We can't reliably forecast future viral behavior based on past ones," Abraham said. "This is why preemptively developing treatment and prevention strategies is so crucial." Since the 1980s, scientists have tried to replicate the success of the Junin vaccine by developing a vaccine that acts against multiple or all viruses of the same family. Traditionally, scientists have homed in on one promising commonality across related viruses: they tend to use the same gateway into their hosts—be they animals or people—a sort of "molecular key," called a protein receptor binding site (RBS), which fits into surface proteins on the host cell like a key in a lock. The RBS tends to be well-conserved across members of the same viral family because evolution discourages frequent mutations to a structure so critical for an organism's survival. Over the last decade, researchers have worked to develop antibody treatments that mimic the "lock" of the host cells as a way to fool the virus into thinking it's attached to a host cell, when in fact, it's locked into an antibody that renders it incapable of entering and infecting host cells. But, as is often the case in the evolutionary plot, there's a twist, Abraham explains. As a virus' natural host, or target, evolves over time, so do the footprints, or the configuration, of the its molecular key—the RBS. The change ensures the virus' compatibility with the host and, in the end, the virus' survival. Viruses limited to certain geographic regions and the hosts specific to those regions shapeshift along with their targets. Thus, members of the same viral family residing in different geographic areas and exposed to different hosts will have both commonalities and differences in their RBS. "Even among viruses that are related and share similarities in the molecular makeup of their receptor bindings sites, you still end up with a substantial degree of variability," Abraham said. This variability, researchers say, has foiled efforts to design broad-acting protective antibodies toward one hemorrhagic fever virus as a way to disarm others. In the new study, however, researchers identified a tiny portion in the molecular keys used by Junin and Machupo that is identical and responds to the same antibodies, rendering both viruses sensitive to the same vaccine. For their experiments, the team started out by obtaining antibodies from a person who had received the Junin vaccine two years prior. They focused on a subset of immune cells known as memory B cells. As the long-term keepers of memories from viral encounters past, these cells store the ingredients and the recipes for making protective antibodies against these remembered viruses. When these cells encounter the same virus later, they quickly dust off the recipe and crank up the production of antibodies to disarm the virus. It is from these very cells that the scientists isolated several Junin-specific antibodies developed as a result of past vaccination. Next, they tested in a lab dish these antibodies' affinity for binding to the RBS of the Machupo virus. Two of the handful of antibodies ended up binding to it. The researchers used X-ray crystallography to pinpoint the exact location and other molecular details of the interaction between the viral RBS and the two antibodies. The visualization technique identified the precise location where virus and antibody latched onto one another—a genetically identical section shared by both Machupo and Junin. That, researchers said, is the very molecular chink that renders both viruses vulnerable to the same vaccine antibodies. This conserved part of the viruses' molecular keys is a promising target for developing antibody therapies against multiple hemorrhagic fever viruses. Junin and Machupo are the most closely related viruses of the Arenavirus family. Even so, more than half of their RBS molecular makeup is different. The new findings, however, suggest that such common areas of vulnerability may exist among other members of the Arenavirus family. "This approach can play an important role in controlling human infection and its most devastating consequences—a goal that's remained elusive," Abraham said. "As we get better in our ability to home in on progressively tinier parts shared across all viruses, we can start eyeing new precision-targeted therapies designed to work on conserved areas across multiple viral species."